These are serviceable waders at an extremely low price. Using nylon fabric and a proprietary waterproof-breathable membrane called Dry-Plus, they give beginners and occasional anglers a viable way to get on the water in comfort. The padded knees make crouching comfortable, but the seam design isn’t ideal for frequent hard use. 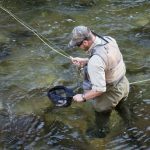 It’s not immediately obvious what differentiates these waders from Cabela’s men’s line. As long as the wearer is 5’7” or taller, the cut is appropriately roomy, with enough ease for multiple base layers. But on women of average height, the fabric bunched unattractively, and on me (I’m a whopping 5’0” tall) the fit was ridiculously large, as if I was wearing my dad’s waders. Even cinched to the smallest length, the shoulder straps are too big to support the bib and keep it from sagging. But the sculpted booties (cut to fit the left and right feet appropriately) are trim enough for my size 6.5 foot. These waders kept my clothes from becoming noticeably damp during low-exertion wading. But I always enjoyed the wave of fresh, dry air I felt when I pulled them off after a fishing session. And during strenuous exertion (like a brushy, mile-long walk) they did steam up, and took several minutes to dissipate that moisture after I stopped hiking. The Dry-Plus Premium is the only model in the test to include padded knees: A piece of neoprene is sewn into the leg and cushions against pebbles and rocks. It’s a nice touch that adds a measure of comfort when crouching for the requisite “grip and grin” fish photo. But they inhibit breathability and contribute to the waders’ tendency to feel clammy. The suspenders are similarly cushy, since they’re made of a single, yoke-cut piece of neoprene. The downside: That thick fabric does trap moisture and sometimes made my upper back steam up. In lieu of a wading belt, two sewn-in-place strips of nylon webbing cinch the waist. That’s nice in that you never have to worry about losing your wading belt (which does have a tendency to slip out of belt loops and disappear into closets and car trunks). But the bunched-up fabric beneath the webbing grew uncomfortable after a few hours’ wear, biting into my waist unless I wore thick shirts as cushioning. The built-in fabric gravel guards stay in place once you’ve wrestled them over your boots (the cut is rather narrow). There’s just one pocket, an internal zippered mesh chest pouch that’s just big enough for a set of car keys. 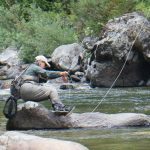 The only waders in the test to place seams along the inner leg (where they’re subject to abrasion from walking), the Dry-Plus Premium may not offer enough durability for many years of use, especially by those who fish frequently. With breathability that’s adequate rather than outstanding, this model seems best for cool-weather use. They’re ideal for light duty and for beginners who may not want to invest too heavily in a sport they’re unsure of. As such, they deliver enough quality and performance to let anglers enjoy themselves on the water.